At this meeting our portfolio and method of working are discussed. The next step is to carry out the survey of the grounds. We will prepare a coloured Outline Masterplan. A hand drawn coloured Detailed Masterplan is prepared. We can provide consultancy throughout the build. Planting can be carried out by Paperbark at client's request. A garden maintenance schedule is provided with the Masterplan. Night lighting at garden near Wetherby, Yorkshire. 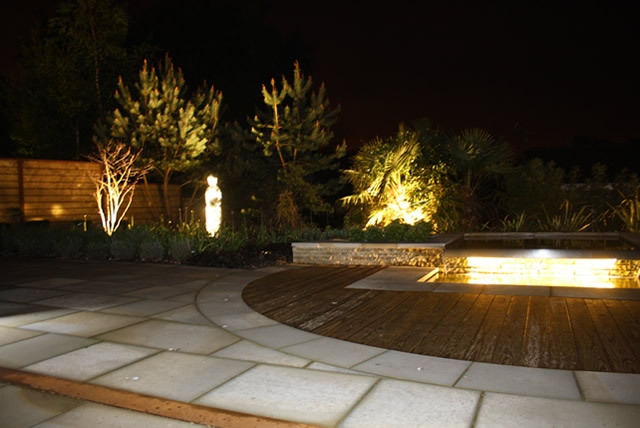 Should you require lighting of your garden, we will incorporate this into the design and build into the scheme using qualified experienced electricians. Special features in the garden can be lit including existing shrubs and trees for a dramatic effect. The garden lighting design is tested once installed and may be adjusted to obtain best results. The garden designer, client and electrician all work together in the garden once night falls! Sculpture design, here steel sculptures were required to contrast with planting. 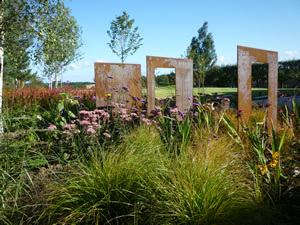 Sculpture is designed and implemented by Paperbark Garden Design. 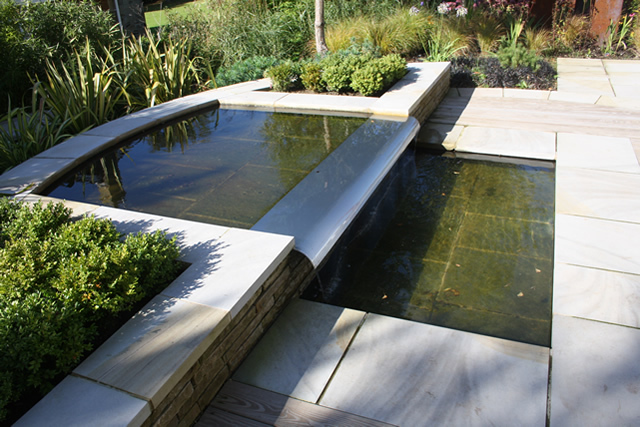 Based in Leeds, we work throughout the Yorkshire region, providing expert garden design and build services to homeowners at very affordable and competitive prices. We utilise our vast experience to design gardens in Bradford, Boston Spa, Ilkley, Selby, York, Wakefield, Denby Dale, Harrogate, Pontefract, Collingham, Leeds, Roundhay, Castleford, Wetherby, Barnsley, Middleton, Keighley, Huddersfield and Headingley.